Ladies and Gentlemen, the race report we’ve all been waiting for. Five long months in the making and it’s finally over! It’s been a long journey, so this post is incredibly lengthy and rambling. I make no apologies for the length, I want to make sure to write down everything I can remember (you know, for the grandkids). I’m starting this race report a day early, in an attempt to capture the entire weekend of activities and excitement, but feel free to skip over the next few paragraphs of intro material to get to the good stuff if you can’t wait. I’m not fast, nor am I brief. Saturday afternoon was spent in a whirlwind of packing, planning and last minute activities before leaving the house. True to form, I was a nervous wreck and Ryan was attempting to calm me down and placate my nerves. I know I must have been pretty difficult to live with this last week, and my darling fiancé is a total saint for putting up with me without killing me. We were spending the night at the Westin, downtown St. Louis with Team in Training so I had to have everything packed and be ready to go the afternoon before. I decided to wear a bumble bee pin on my tank in memory of Ryan Brown, who loved bumble bees (I’m a Beeliever). I also ironed my name on the front of my shirt and "In Memory of RDB" on the back – for Ryan Douglas Brown. We arrived at the Westin just in time to check in and get downstairs for the TNT Pasta Dinner. To be honest with you, I wasn’t really feeling the TNT love at this point. I’d been having a lot of mixed feelings about TNT and a general lack of inspiration about the program. I loved the idea of running a marathon to raise money for a charity – and cancer research is about as great as they come – but I didn’t feel like I had the quintessential TNT emotional bonding experience that I anticipated. But all that was about to change. My friend Lindsay, who previously ran the San Diego Rock and Roll Marathon with TNT told me that her favorite part of the experience was the Pasta Dinner. Being a big fan of all things carb-related, I was already a fan. I figured it would be cheesy and sappy and inspirational and all of that good stuff. And it was…only better. Ryan and I sat at a table with Abby, her mom and a few coaches. We heard that together we had raised over a quarter of a million dollars for the Leukemia & Lymphoma Society. I was pleasantly surprised to find out that I was at the top of the fundraisers, bringing in almost $5,000!!! We listened to a pediatric oncologist talk about how running had literally saved his life, and how TNT’s donations make a difference in the lives of the children he treats. We heard from a mother whose son had been diagnosed with cancer six times, fighting each time to overcome it. He was even there to talk about his survival and thank us (of all things). He will be starting college in the fall – how amazing. By the time I left, I felt so good about my decision to do this through TNT and so proud to have been a part of something that truly makes a difference. Surprisingly, I slept rather well Saturday night. I guess I was making up for all the missed sleep from the week leading up to the race. I woke up Sunday morning around 5:00, groggy, but excited. I had all my race clothes laid out and ready, so I Body Glided up and got dressed. Breakfast was muffins and water, but I was too nervous to eat much. I packed a bag of emergency supplies (band-aids, lip balm, sunscreen, extra socks, Gatorade, etc.) for Ryan to carry and we went downstairs to meet up with the rest of the TNT crew. We left the hotel and walked up to the race in a sea of purple. The temperature was in the low 40s, but was supposed to warm up to almost 70 degrees and sunny by noon. Perfect running weather. Abby and I had no trouble finding our training buddy Jenny, my friend Julie, who was running the half marathon and my mother, who would be our official race photographer. It was an amazing site to see the huge American flag hanging over Market Street with the old Capital Building and the Arch in front of us. We all walked up to the starting line together, with just enough time to snap a couple pictures before we were off! The first six miles were fantastic and flew by. We were all so chatty and excited and having a blast. The race course took us through the historic Soulard neighborhood, where Julie and I had both lived for the past 4+ years, which held a lot of memories for us. We circled a park near the Anheuser Busch Brewery and headed back towards downtown. The sun was just starting to come up and we were warming up nicely. I couldn’t believe all the people out there cheering the runners on. And so many of them specifically cheered for Abby and I because we were wearing the Team in Training shirt. "Go Team!" At mile 6 I spied my personal cheering crew of Ryan, his mom Bonnie and my best friend Kasey. I dropped my jacket off with them, smiled and waved and kept moving. About a mile later I saw my mom, which made me so happy that she was there, even though I’m sure she has no clue why her other-wise sane daughter would decide to do something as crazy as run a marathon. With about 4 miles to go before Julie (and the rest of the half marathoners) turned around and heading back towards the finish line we started seeing the other runners coming back down, getting closer to their goal of 13.1. So, we cheered…loudly! We tried to give a shout-out to every single TNT runner we saw, with plenty more cheering for everyone else. And this just made it so much better for us. At one point I looked at Abby and said, "Do I dare say it? I’m having so much fun!" We saw my mom again at Mile 10, who snapped some really great pictures of just how happy and excited we were. After that, the half marathoners left us and the crowd thinned out dramatically. I couldn’t believe the difference as we entered Forest Park to emptiness and silence. It was about this point when I realized just how much farther and longer we had to go. Immediately I felt pretty drained and tired. This is also the part of the course that I know the best – and I know it’s really HILLY. But there was good news too: (1) we had paced ourselves very well and we were still exactly on track for finishing in between 4:45 and 5:00, which means we didn’t go out too fast (which I was terrified of doing); (2) Abby’s best friend just booked her wedding ceremony and reception venue, which turned out to be somewhere along the race course. She was going to be there waiting to surprise Abby with the news. How cute is that? (3) we were still together and having fun. Forest Park is one of my absolute favorite places in the city. It’s HUGE at 1,293 acres (approx. 500 acres larger than Central Park) and has amazing monuments, historic buildings, wildlife, waterways and landscapes. I love running in the park and know it well; this was home turf. This was also about the time when other runners started talking to us. We were passed by an older gentlemen who said he was working on completing his 50 states marathon, fulfilling his Missouri requirement, and had previously run with TNT. He told us how much it meant to him and what an amazing experience it was. We also ran with a lady who said she was a leukemia survivor and was featured in one of the TNT pamphlets. She thanked us for doing what we were doing. Unbelievable! When we got to the Forest Park Visitor’s Center, Abby’s friend was waiting there to tell her that’s where the wedding would be. It’s a beautiful venue and I’m sure it’ll be a fantastic wedding! Just down the road we met up with TNT coach Michelle, who told us how wonderful we were doing – as if we didn’t know it!! We got out of the park just to go up a massive hill that runs along the Washington University campus. There were a bunch of kids at one corner saying that their High 5’s were super-powered for extra speed. I made sure to give them all a High 5, just in case they were right. We were at mile 16, Clayton was next. We were approached from behind by a red mini-van full of Abby supporters. Team Abby had signs, music, horns, and more excitement than we could have hoped for. It was great to see them. They sped off as we topped a hill and then saw my mom and Anna waiting for us. What an amazing site to see that little blonde smiling and clapping for me this time. Mom pushed her in the wheelchair along-side us for a while and told us she’d see us at the finish line. As I looked away and back to the course, there was Ryan again, waiting and smiling. I cannot express how amazing our support crews were. We were never too far from friends and family though the whole course. The next few miles of the race (17-21) were perhaps the most painful. Abby and I both started to really hurt. Her knees were bothering her and my hips, quads and back were screaming. Our training runs never felt this bad, it must be the hills. The hills in the park, Clayton and University City were all miserable. There was a guy ahead of us that stopped running to take pictures of every hill we ran because he said people didn’t believe him that this course is so hard and hilly. I believe you! But there were also a few runners that kept us smiling. The former TNT runner that we met earlier showed up again and asked me about RDB. It felt great telling him all about Ryan Brown and his family as I was pushing myself like that. At mile 21 we saw Ryan, Bonnie and Kasey again! I love you guys. At this point I really wanted to stop. I told Ryan my legs were dead and he smiled and told me how proud he was of me and to just keep going. I really needed to hear that. As we entered Forest Park again Abby said her knees were hurting her too bad to keep running. She wanted to walk a while and told me to just keep going. I didn’t want to go without her. Never leave a man behind. But she told me to go, and I knew if the roles were reversed, I would want her to keep running. So I ran. It was a lonely last couple miles to the end. At this point I just had to pick a spot on the course ahead of me and run towards it. When I got there, I’d pick another. And repeat. Luckily there was a lot of TNT support to help me along in the last 2 miles. I bet at least 6 TNT people took turns running beside me and encouraging me to keep going. Towards the end, my coach Rhonda was there with a smile and more kind words. Thank you all. And once I got close to that big American flag again, I saw my friends Jacquie and Heather. I know I didn’t (couldn’t) show it at the time, but it was so great to see you two! Heather ran beside me for a block or two until I made that final turn into the corral of spectators and saw the finish line. Rounding the corner at the finish. What an unbelievable feeling!! I was all alone. Everyone there was cheering for ME. I was laughing and crying. I saw my mom as tears poured down my face. I crossed the finish line in 4:53:21. My medal and finisher's cap. My support crew: Bonnie, Kasey, Jacquie and Heather. I also want to congratulate Abby, who finished in 5:08:02. You rock!! And Julie finished her second half marathon in 2:19:56. Great job ladies!! I am so proud of you. You made me teary at work!!!! Wonderful, wonderful, wonderful job. What a fantastic race report and wonderful pics. I'm so proud of ya! Congrats again..you're a marathon runner!! Your post was so inspiring! It's given me a boost of inspiration for my own (first) marathon training. Oh, wow...girl, that was such an amazing read--I am so immensely proud of you! I wish I could have run that with you--I hope I do half as well on my first! The photos are excellent, too...tell your mom she did a great job! Sara, you did so well conquering your first marathon. I loved reading all about it. I think it's great that you had such a strong support system and the thoughts of Ryan Brown to keep you going when things got tough. Congrats again (and again!). you made me cry two days in a row! brilliant report, thanks for sharing. You rock! You're an amazing and inspiring young woman, Sara. I am so happy for you and so proud of you! Your race and your report could not have been any better. Congratulations on the successful culmination of your countless hours of training in heat, humidity, cold, snow and ice, and everything in-between, your miles upon miles of running, through feeling good, and feeling poorly. Such an unselfish accomplishment as well with all the contributions you brought in for TNT and running in memory of Ryan. God is smiling down on you, girl! Your should be incredibly proud of yourself. Oh, and you made me cry too! Congratulations to Sara the MARATHONER!!!! As soon as I had computer access late on Sunday night (I was out of town and traveling back home) I checked the St Louis Marathon site to see how you did and I was soooo excited to see that you finished - and under 5 hours to boot! Amazing!!!! Your race report was a great read and I will take from it many lessons as I prepare for my first marathon - have fun, be social, recognize that you can run through the pain and still feel exhilarated at the end, etc. Lastly, I believe that the next time I run a marathon (don't tell my wife that I'll be doing this again...she'll kill me!) I will be running for a cause...your running in memory of RDB and running with TNT has inspired me. 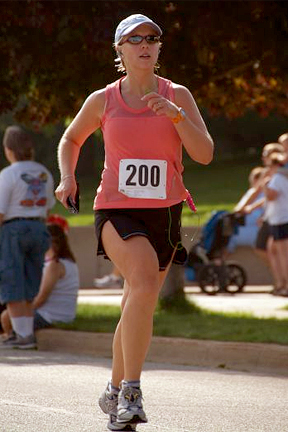 Sara, thank you for sharing your race with us! I really got a sense of how it felt to be there. Congratulations on accomplishing so much- running the distance, running the distance with a terrific time!, having the dedication to train for it, supporting TNT, keeping the memory of Ryan alive, inspiring Anna and others including myself. You are a sweetheart! I'm so happy that this was such a positive and enjoyable experience for you! Congratulations, Sara!! You are the true meaning of FIERCE!!!!! That is so AWESOME Sara!!! You did it and did a great job. I usually tear up at the finish line when I finish marathons... and just teared up reading about your finish. What an incredible accomplishment! And it's made even more incredible by your dedicating the race to Ryan. Congratulations! What am amazing accomplishemnt, you are truly an inspitation to everyone who reads your blog. Brooke passed on the good news on Monday congratulations! I hope to see you soon for a celebratory drink! How INCREDIBLE!!! Your race report was so touching and well put! When I first opened it I thought you were crazy for doing a marathon but now I am inspired and so very proud of you! You are an excellent writer...you brought tears to my eyes! Over running!! LOL! Way to go and congratulations...You did it! !